When we came to Kuwait some 7 years ago, we lived in a different, much older building that overlooked a busy and bustling shopping lane. Most of my days were spend filling up forms and applying for jobs or cooking up storms with food network always playing in background. You could find me, either mimicking Nigella Lawson while stirring my pot of stew, or practising my British accent every time Gordon Ramsay came on. Those were the shaping years of my cooking style and opened up a whole new world of food for me. I cooked 5 meals a day, dessert included. One such December day, when whole of Kuwait was enveloped in fog, I starred down at the large hoardings of sales and flickering red and blue lights, keeping cozy with warm, dark and hot chocolate mug in my rabbit fur socks (which are now buried deep into suitcases of memories), while Jamie cooked a Christmas feast on television. I snapped out of my trace, eager to cook. It could be his darling lisp or sheer passion for food, that inspired me to cook a Christmasy feast that day. A whole bird was cooked, pie was made and sides were sorted. Despite having watched chefs use measuring spoons, I used my hands and eyes to measure spices, and rubbed it on the chicken just as my mom would, vigorously and definitely. I marvelled and patted myself for the glisteningly golden brown perfection I created, fragrant, masala coated plump bird. It got a final tempering of ghee and curry leaves, sizzle so loud it overtook the timer I had kept for the pie baking in the oven. Or it could be the tantalising spicy aroma I got carried away with, that I nearly burned my pie. The pie, as expected was very short of perfection, it was my first pecan pie and we might have partly finished it because pecans are expensive. There was just two of us to eat all that and we had leftovers that lasted for days. Sometime last week I ran through the same episode of Christmas by Jamie Oliver at my gym (yes, I watch food shows on treadmill!) and felt that same sense of inspiration to cook a feast. Except, by the time I got home, the only thing I could whip up is an egg roll. 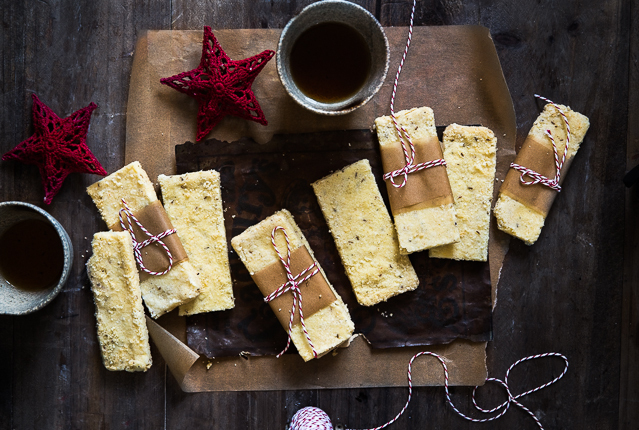 When the entire house had resigned to bed, I tiptoed to the kitchen to make this shortbread. I started working on this recipe sometime last year but after several failed attempts I passed it. My expectations from it where many. They had to be salty, but the kind of sweet and salty you could associate it salted caramel. They had to melt in your mouth and yet have a crisp texture. And most important of it all - they had to be good with tea. Armed with inspiration and tad bit more ghee than I would use, this sweet and salty, cumin studded biscuits (as we would call it in India) were made. This essentially is a shortbread, but with ghee. Compared to butter, the ghee flavour enhances the spices in here, letting them shine while providing a mild nutty and rich mouthful. If you had cumin rusks in India, this is not that. 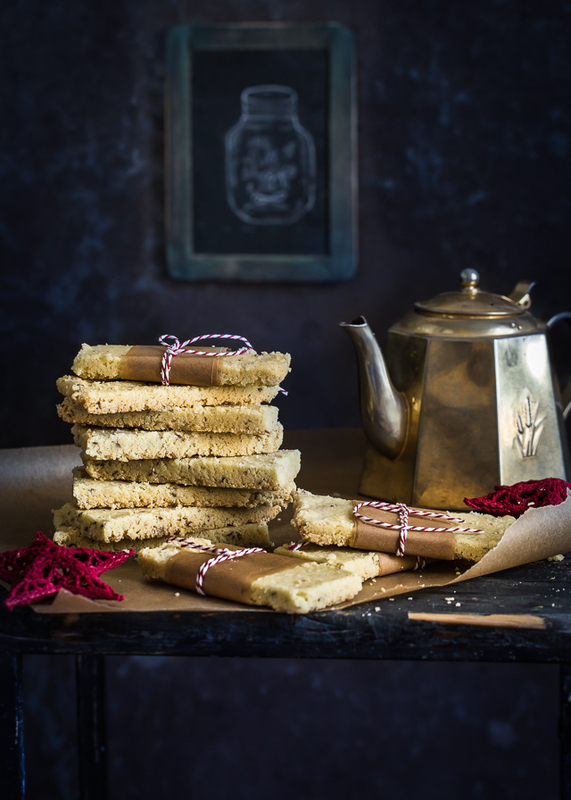 It's more like the flavour from the cumin rusks and texture of nan khatai rolled up into a crumbly shortbread. This recipe can easily be doubled. Use good quality, pure ghee for best results. When they come out of the oven, you will feel like they haven't cooked enough! But be patient, let them cool completely. * If you don't find super fine semolina, blitz it in a grinder before using. Preheat the oven at 180 C. Prepare a 11 inch square baking tin by lining it with a parchment paper. Measure the ghee and tuck it in the freezer for at least half an hour. Meanwhile whisk together the flour, semolina and salt. In a separate bowl add the sugar, pepper and cumin seeds. Rub the sugar and cumin seeds together in between your fingers for couple of minutes. This might be an extra step but totally worth doing to get a cumin-y scent in your biscuits. Add the chilled ghee and whisk until it's smooth and fluffy. Whisk in the flour in two parts. The dough will look like pebbles and you would think it would never come together. Dump the mixture in the prepared tin, and using a cling film spread out the mixture with your hands to about 1/4 inch thickness. You could use any flat tin just as long as you get the thickness right. Wrap it lightly in cling film and freezer for at least 30 minutes. Alternative you could refrigerate it for 4-5 hours or upto 2 days until you are ready to bake. This is also a good time to trim the ends if you using a non square tin. Bake it directly from the freezer for 25 minutes. They will still feel very soft when out of the oven. Cut them out into equal size rectangles as soon as it it out of the oven with a very sharp knife. Let it cool in the same pan. 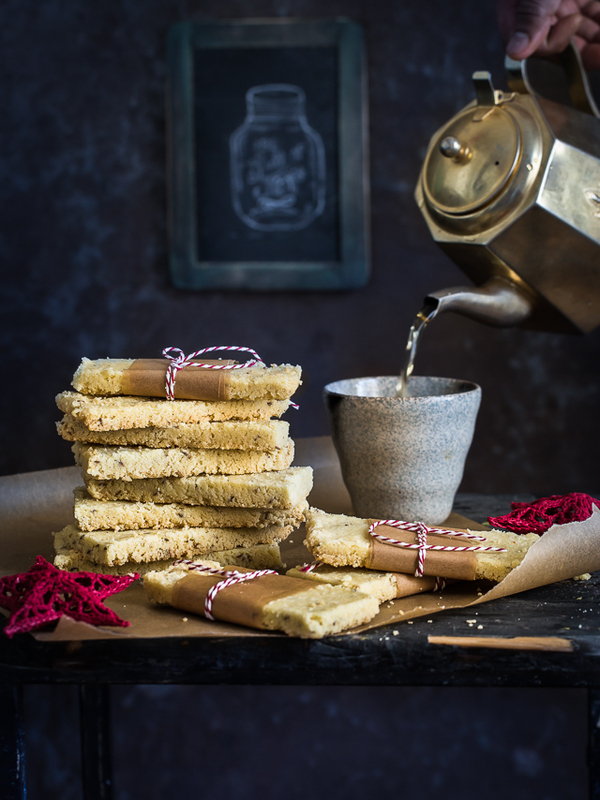 Lovely shortbread and interesting flavor combination! Stunning! What a desi twist to the twinkles and the stars of the festive season! Hi!... Very happy to come across ur blog through the comment section of another!! Nice blog!! Happy to follow ur blog and will be happy if you follow me back. Use of ghee is new..should try...love ur clicks!! Would love u to visit my space!! Beautiful recipe, Kulsum. I love sweet and spicy together - the richness of the ghee and black pepper sounds like winning combination. Hoped to check whether you had done anything new... forced to leave another comment - these are stunning!